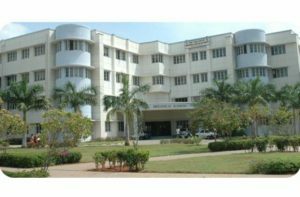 Padmavathi College Of Pharmacy is situated in Dharmapuri, Tamil Nadu. Address of college is Krishnagiri Main Road,Periyanahalli Postdharmapuri -635205,Tamilnadu. It is an Unaided – Private type of college. It was established in 1994 under the aegis of Padmavathi College Of Pharmacy. The college is affiliated to Tamil Nadu Dr. M. G. R. Medical University, Chennai. The institute has gained the approval of All India Council for Technical Education (AICTE),Ministry of Human Resource Development, Government of India and is recognized by University Grant Commission of India, New Delhi. PSG College of Pharmacy (PSGCP) was established in the year 2001 and is one more jewel in the crown of the PSG group, who are well known for their commitment to high standard education. The college of Pharmacy, which has now completed 11 years of existence and commitment to excellence in Pharmacy Education, is located adjacent to the PSG Institute of Medical Sciences and Research at Peelamedu in Coimbatore city, which is blessed with a temperate climate and excellent living conditions. The college is affiliated to the prestigious “The Tamil Nadu Dr. MGR Medical University” Chennai and also approved by the AICTE and PCI, New Delhi. Since 2005, the college is consistently meeting annual ISO (International Organization for Standardization) Certification Standards. The college has good infrastructure with state of the art teaching and research facilities for students. PSG Health campus also has state of the art auditorium hall capable of hosting national and international conferences. The College has well equipped laboratories catering to the various disciplines like Pharmaceutics, Pharmacology, Pharmaceutical chemistry, Pharmacognosy, Pharmaceutical Analysis, Pharmacy Practice, and Biotechnology. The library facilities encompass two full floors and every year Rs. 20 Lakhs worth of literature is being purchased to bring the library up to date with the latest information in the field of pharmacy. The pharmacy college was recently ranked in the top 25 pharmacy colleges across the nation, which is indeed a phenomenal achievement for a privately funded institution which has only very recent history. Its philosophy is embedded in its commitment to quality as well as its vision and mission statements. The PGP College of Pharmaceutical Science & Research Institute, promoted by Dr. Palani G.Periasamy, is a ‘Dream come True’. It is a grateful gift of a son of the soil to his native place. It has been a long-cherished dream of Dr. Palani G. Periasamy to start a college close to his native place to cater to the intellectual needs of the youth of Tamilnadu in general and of Namakkal District in particular. This dream has taken a concrete shape with the establishment of this college in 2007. The PGP College of Pharmaceutical Science & Research Institute, promoted by Dr. Palani G.Periasamy, is a ‘Dream come True’. It is a grateful gift of a son of the soil to his native place. It has been a long-cherished dream of Dr. Palani G. Periasamy to start a colleges close to his native place to cater to the intellectual needs of the youth of India in general and of Tamilnadu in particular. This dream has taken a concrete shape with the establishment of this college in 2007. The objective is to promote the college into an Institution of Excellence, which will serve the youth by providing them with an easy access to higher education and offer high standard education to students from other parts India and also from all over at world. The college strives for the integrated growth of the students in which their intellectual, moral and cultural development taken proper care of. It inculcates discipline, higher levels of culture and finer values of life in the youth. Nandha College of Pharmacy, a flagship brand of Nandha Educational Institutions was established in the year 1992, under the dynamic leadership of its Chairman. Thiru.V. Shanmugan, B.Com. Due to his aspiration to provide quality education and encouragement, the college has grown up in all academic fronts and is recognized as one of the best pharmacy colleges in the state of Tamilnadu, India. The institution offers D.Pharm (2years), B. Pharm (4 years), Pharm. D (6 years), M.Pharm (2 years) in five specializations and Ph.D. The college is recognized by Government of Tamilnadu, approved by All India Council for Technical Education (AICTE), New Delhi, Pharmacy Council of India (PCI), New Delhi affiliated to The Tamil Nadu Dr. MGR Medical University No. 69, Anna Salai, Guindy, Chennai, Tamil Nadu, India. It is accredited to National Board of Accreditation (NBA), AICTE, New Delhi. The college is housed in an imposing building located in a lush green, eco friendly, calm and serene atmosphere with salubrious climate on Erode – Coimbatore main road and close to Perundurai and Erode, a well-known textile city. The nearest railway station is Erode Junction. Trains from other parts of Tamilnadu, Karnataka, Andhra Pradesh, Kerala and other states of India pass through at frequent intervals. Erode town is well connected by long distance bus service too. The nearest Airport is Coimbatore, at a distance of only 75 Kms from the college. The College is thus catering the requirements of students across the Globe.